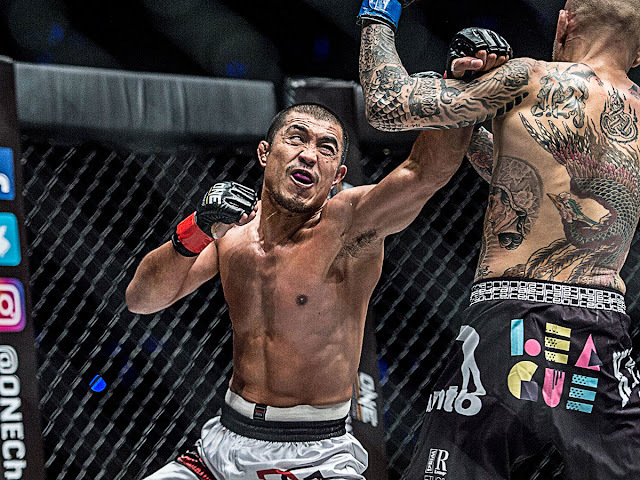 Eric “The Natural” Kelly may have fallen in recent times, but the Filipino martial arts veteran still feels that he has something more to prove as he attempts to sparkplug his professional career under the ONE Championship banner. Reeling from a three-bout losing skid, Kelly is determined to reinsert his name into winner’s column as he is slated to take on returning Brazilian standout Rafael “Indio” Nunes. Both men are set to face each other on the undercard of ONE: GLOBAL SUPERHEROES, which takes place at the 20,000-capacity SM Mall of Asia Arena in Manila, Philippines on 26 January. The 35-year-old Baguio City native was once considered as one of the best and brightest featherweight contenders in the Asian region when he started his martial arts run in 2009, but his billing lost its luster due to a string of setbacks. When Kelly entered enemy territory to face Malaysian-Kiwi dynamo Ev “E.T.” Ting in January 2016, he suffered a third-round submission defeat at the hands of the future ONE Lightweight World Championship title contender. Kelly tried to bounce back from his loss to Ting by squaring off with former ONE Featherweight World Champion Narantungalag Jadambaa seven months later, but he yielded to the Mongolian hard-hitter by way of knockout in 44 seconds. A victory inside the ONE Championship cage remained elusive to Kelly as he bowed down to ex-ONE Lightweight World Champion Kotetsu “No Face” Boku in a featherweight encounter via third-round technical knockout in August of last year. Kelly looked good in the early rounds as he rocked Boku and nearly stopped the bout with a flurry of punches in the opening stanza. Picking up the momentum from the first frame of action, Kelly then went on to knock Boku down in the second round again. However, the Japanese warrior showed resilience to recover both times and rally to a thrilling comeback in the final canto. Despite the series of losses, his confidence remains unfazed as he brings a indomitable and positive attitude into his upcoming bout against Nunes at ONE: GLOBAL SUPERHEROES. Nunes boasts an impressive professional record of 10-1, with five victories coming by way of submission and another four by knockout. The last time that Nunes competed was back in June 2014 when he made his promotional debut opposite Japan’s Koji “The Commander” Ando at ONE: WAR OF DRAGONS. On that night, Ando cleverly submitted the spirited Nunes via rear-naked choke in the opening round. Nunes has not been able to avenge his lone blemish in his career as illness and injury have derailed his comeback. More than three years after his last match, Nunes’ hunger for his first win on the global stage might only be rivaled by Kelly’s desire to get back on the winning track. According to Kelly, it is not easy to study an opponent who lives on the other side of the world and coming off such a long layoff. Although a tough task is in front of him, Kelly is more fired up than ever to arrest his losing spell and deliver a winning performance at ONE: GLOBAL SUPERHEROES. “My opponent is a human like me, and everyone is beatable. I always put that in my mind. Right now, I have to redeem myself in front of my countrymen. I might be 35 years old, but I am not giving up. I am here to stay,” he declared. ​​​​​​For more updates on ONE Championship, please visit www.onefc.com, follow us on Twitter and Instagram @ONEChampionship, and like us on Facebook at https://www.facebook.com/ONEChampionship.